Released on July 11th, 2013. 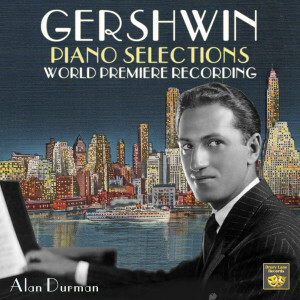 ‘GERSHWIN: PIANO SELECTIONS’ is a follow-up to Alan Durman’s previous successful CD, ‘GERSHWIN: BRITISH PIANO SELECTIONS’ which was featured in David Mellor’s ‘New Releases’ Show on Classic FM. He said ‘Alan Durman is a very proficient exponent of Gershwin’ and ‘It’s like sitting in a superior piano bar hearing Alan play’. This time, Alan performs never-before-recorded selections from George Gershwin’s New York productions, ranging from little-known shows like ‘La La Lucille’ and ‘Song of the Flame’ to blockbusters like ‘Strike Up The Band’ and ‘Of Thee I Sing’. Alan also includes a selection from the Fred Astaire movie: ‘Shall We Dance’. In 1919 George wrote the music for his first ‘book’ show ‘La La Lucille’ and never looked back. He went on to write songs for a series of ‘George White’s “Scandals”’ revues, collaborated on the music for ‘Song Of The Flame’ with Herbert Stothart and ‘Rosalie’ with Sigmund Romberg, followed by three classic musicals: ‘Strike Up the Band’, ‘Girl Crazy’ and ‘Of Thee I Sing’, before moving to Hollywood to write two Fred Astaire movie scores.